I just got the cover design for Skating on Stilts, my policy memoir about DHS, terrorism, and technology. I found the artist, Mart Klein, on line and explained the basic picture I had in mind. Much credit to Hoover Press, though, for the font and cover design. Book covers, like everything else in publishing, have been deeply affected by Amazon. You have to pick a design that is recognizable in a tiny thumbnail sketch as well as on the shelves at bookstores. This works for that purpose. Plus, I just really like comics-style illustration, and there’s a hint of Jim Steranko in this cover. Publication is set for June of this year. TSA is facing new challenges from powerful explosives hidden in areas that usually can’t be searched until after dinner and a nice wine. No one is wild about the millimeter wave and backscatter machines that show how we’d look on the beach if we were dumb enough to wear Speedos. The “puffer” machines that tried to find traces of explosive vapor were a better idea in theory but they didn’t work well in realistic airport trials. What to do? Turns out, there is an alternative. My favorite airport search technology while I was at DHS is at last being commercialized. They have a great sense of smell, they can be trained a lot cheaper than dogs, they recognize more smells, and when they retire after a few days on the job, they make honey for you. After getting a number of email requests for this testimony, I’ve posted it up for convenience at SSRN, although it is also available through the hearing page as well. I submitted along with it my earlier Weekly Standard article, Predators Over Pakistan. As I have said here earlier, however, this hearing on March 23 came just ahead of Legal Adviser Harold Koh’s March 25, 2010 ASIL speech. Dean Koh’s speech addressed many of the criticisms made of administration policy on drones, and I should add, in ways that I thought substantively correct as a matter of legal policy. I thought the Legal Adviser’s statement strong, clear, and substantively excellent. Overall, I was pleased with the form and direction of its legal framework (if you look at the second half of the Predators Over Pakistan article, the more legally oriented part, you will see that my analysis tracks certain parts of the Koh speech analysis fairly closely). I was also impressed with its directness – it was not filled with careful dodges and lawyerly hedges that would make it impossible to find a clear takeaway, quite the contrary. Update: I have had a chance to watch the video twice – I strongly recommend watching it, as it adds considerable language to the statements below in the press release. And welcome Instapundit readers and any others. Given how much I have pressed publicly for a statement by the administration’s lawyers, I want to say this much even while I’m still doing a careful lawyerly parsing of the text. First, let me praise Harold Koh for stepping up to the plate. This is a plain, clear statement of the US view of the law and its application. It is measured, and yet exceedingly direct. My thanks and congratulations to the Legal Adviser for something that stands as clear opinio juris of the United States. As someone who has been calling every more sharply for a public statement by the administration’s lawyers on targeted killing and drone warfare – most recently in a Weekly Standard article on exactly that theme, again this week in a sharply worded statement to a House subcommittee hearing, and an Ari Shapiro interview on NPR this morning recorded a a month ago – this was an enormously positive step. I tried to use my time at the conference to think through some of the questions I’ve been raising both in my first published piece on this subject, Targeted Killing in US Counterinsurgency Strategy and Law, and in the long opinion essay in last week’s Weekly Standard, Predators over Pakistan. I’m going to do a series of posts extending some of those discussions. With his usual nudge-and-wink, Matt Drudge invites us to be dismayed that “BIG SIS” — his moniker for Janet Napolitano — is “Monitoring Web Sites for Terror and Disaster Info.” Drudge links to a story saying that DHS will be monitoring social media like Twitter, as well as websites like Drudge, to keep abreast of events during the Winter Olympics. The source of the story is a twelve-page “Privacy Impact Assessment” issued by DHS. This isn’t the first Privacy Impact Assessment (PIA) on DHS’s use of social media. A few weeks earlier, DHS wrote a similar assessment of using social media during Haitian rescue operations. I am indeed dismayed, but not for Drudge’s reasons. True, it’s disappointing that neither the Volokh Conspiracy nor www.skatingonstilts.com is deemed worthy of government monitoring. But what’s really dismaying is that DHS and its Privacy Office felt obliged to labor over two separate and painfully obvious privacy assessments just to do things that you and I would do by simply firing up our browsers. “7.1 What are the procedures that allow individuals to gain access to their information? No matter what your particular legal viewpoint about detention and Guantanamo, this report will be required reading because of the breadth and depth of its analysis – running to all the extant cases. Ben Wittes is a leading scholar at Brookings in this area and UTexas’s Bobby Chesney is both a leading scholar, and also someone who took on Most Thankless But Important Job in conducting a major review for the Obams administration on detention policy. Rabea Benhalim is a Brookings Institution Legal Fellow in Governance Studies. President Obama’s decision not to seek additional legislative authority for detentions at Guantánamo Bay, Cuba—combined with Congress’s lack of interest in the task—means that, for good or for ill, judges through their exercise of habeas jurisdiction are writing the substantive and procedural rules governing military detention of terrorist suspects. Our purpose in this report is to describe in detail and analyze the courts’ work to date—and thus map the contours of the nascent law of military detention that is emerging from it. The persistence of policies across ideologically divided administrations is good evidence that those policies are now mainstream rather than partisan and ideological. Of course, many people will continue to disagree with them, just as many people continue to object to a standing army and a central bank; but these people are now officially on the fringes. There will also continue to be arguments about interrogation practices and the like, but a wide range of Bush administration policies—indefinite detention without charges, trials by military commission, the use of military force against suspected terrorists in foreign countries, secrecy privileges that undermine litigation against government officials responsible for terrorism policies, profiling on the basis of nationality, and much else—are now politically entrenched. How Does Cost-Benefit Analysis Draw Lines in the Sand? Many of us who write, read, and comment on this blog work frequently with cost-benefit analysis, perhaps typically through discipline specific tools, whether in economics or finance or business or engineering or other disciplines. In my case, in my day job I’m mostly an international business-finance professor who uses the typical, and really not very sophisticated, tools of net present value, discounted cash flow, and so on, in my day to day work. I apply these ideas sometimes in my work in public law, but mostly these are, in my case, workaday tools in relatively narrow business contexts. I understand CBA, that is, at the highly discipline-specific level of standard private firm decision-making. And I think, after a fair amount of philosophical study, I understand it at the most abstract level as consequentialism, and its many philosophical arguments. But oddly, I don’t think – despite reading a couple of textbooks and much besides on public (rather than private firm) finance theory – I really understand the “mid-tier” of cost-benefit analysis applied to public policy problems, in the way that, for example, Cass Sunstein writes about pretty much everything as a cost-benefit problem. Yet this is where CBA seems to be most offered as a policy template – and yet which puzzles me in many ways. A difficult real world lesson for academics like me is that execution matters. It very often matters much more than institutional design. A suboptimal institutional design often matters less than how it is executed, and the attention with which it is executed. Hard for academics like me to keep in mind, because we are conceptually oriented and almost by nature care more about the design of a system than the messy, daily details of how, or whether, it is carried out. We tend to think, correctly, that incentives matter and that execution will tend to flow where the incentives flow. True, but not the whole story; there is another story (much discussed in business literature these days) that execution is not merely an afterthought – another too-easily made economists’ assumption – but a process that has its own dynamics. The Christmas attack brings these problems of both institutional design, but also execution failure, to the fore as the disastrous performance of government agencies once again takes center stage. 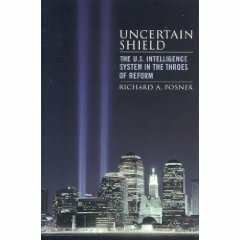 Watching the institutional blame game now starting to unfold (see also the excellent article by the NYT Scott Shane) caused me to recall three short books written by Judge Richard Posner a few years ago, as part of a Hoover Institution series from Rowman and Littlefield, on domestic counterterrorism. He was writing particularly from the vantage point of analyzing institutional design, but then going on to discuss the many reasons why government agencies are typically so appallingly bad at execution. His basic observation was that bureaucratic coordination in domestic counterterrorism was nearly unachievable, for reasons related to the internal governance of bureaucracies, agent-principal failures, and other reasons. Reasons that were partly bad incentives – but also simply the inability to get bureacratic focus on execution. I’m traveling, so have not been able to comment as I’d like regarding the Christmas terror attack. However, I wanted to add one thought about cost benefit analysis and counter-terrorism. A couple of years ago I wrote a paper on ways in which the American political class is riven by deep foundational disagreements about the proper way to approach transnational terrorism. It is partly implicated in the “war” versus “law enforcement” argument, but actually it goes deeper than that – is it possible to have an offensive strategy against terrorism, or is the only long term possibility defensive perimeters represented by such things as airport screenings and the like? That, and an even more pessimistic possibility that simply says, following the John Mueller-James Fallows analysis, get used to it and anyway the chances of you getting killed by terrorism are smaller than a lightning strike. The American public does not buy the “get used to it” approach and so, at least as a matter of public speeches and public stances, no American administration will do so, either. Instead, the argument divides over offensive versus defensive approaches, and over strategies that adopt a strategic view encompassing both a strategic vision that includes going on offense against terrorists as well as defensive strategies, contrasted with strategies that are, by their nature, tactical and defensive. The American political class is quite divided over this strategic question – viz., can there be a “strategy,” or is the only strategy really a defensive retreat to defensive tactics?